When the Bantam Tools™ Desktop PCB Milling Machine is in operation, it dutifully attempts to precisely follow every instruction it receives. If, however, the instruction tells the milling machine to move into an invalid position, the milling machine may collide with itself or damage the part being milled. The software's collision warnings help prevent this undesirable situation. What is a collision and what problems can it cause? There are two types of collisions that the software’s collision warnings can prevent: bed collisions and frame collisions. If the program being run on the milling machine lowers the tip of the tool past the top of the spoilboard or T-slot bed, it causes a bed collision. This can cause the milling machine to mill into and damage the spoilboard or T-slot bed, damage the part being milled, or cause the tool to get stuck or break. When the software detects a bed collision, the warning “Toolpaths may cause collision with bed” appears in the plan panel. Video: milling machine Frame Collision in X axis. Video: milling machine Frame Collision in Y axis. Video: milling machine Frame Collision in Z axis. If the milling machine’s x, y, or z carriage attempts to move past its boundaries, a frame collision occurs. Because the milling machine’s axes are open-loop, the milling machine won’t know when this happens and will attempt to continue as if nothing is wrong. The stepper motor will continue to attempt to spin, but the physical barrier in the way will prevent the motor from moving. This causes a discrepancy between where the milling machine thinks the carriages are and where they actually are in physical space. This discrepancy causes further motion to occur in unexpected locations and can damage the part being milled, as well as cause the milling machine to mill into the spoilboard or T-slot bed. When the software detects a frame collision in the X or Y axis, the warning “Toolpaths may cause collision with frame” appears in the plan \panel. In the Z axis, “Toolpath may cause spindle to retract too far” appears. After opening and configuring a file,the software simulates its motion and determines whether the toolpaths will cause the milling machine to move outside its expected boundaries. If the software determines that the milling machine will move outside the valid milling boundaries, a collision warning will appear in the plan panel. The software will not prevent you from milling, but you should only do so at your own risk. What should I do if there is a collision? If a collision occurs while milling, immediately push the milling machine’s emergency stop button. This stops all milling and prevents any further damage. With the milling machine stopped, twist the emergency stop button to re-enable the spindle, and re-home the machine in the software. The milling machine will retract and recalibrate its x, y, and z axes. Check to make sure that the tool has not broken, and inspect the material for damage. Make any design or CAM changes necessary to prevent the collision before attempting to run the job again. If the collision was a bed collision, remove your material and inspect the spoilboard/T-slot bed. If the damage was minor and the spoilboard remains smooth, it can be used as-is. If the damage was more significant, follow these instructions to resurface the spoilboard. Alternatively, you can purchase a replacement spoilboard. If your T-slot bed was significantly damaged, please contact our support team for assistance. How do I prevent collisions? When configuring your job in the software and in CAM, all of the motions should be within the milling machine’s machining boundaries, which are a shape roughly the width and depth of the spoilboard, between the top of the spoilboard (or T-slot bed, if the spoilboard is removed) and the bottom of the x carriage. 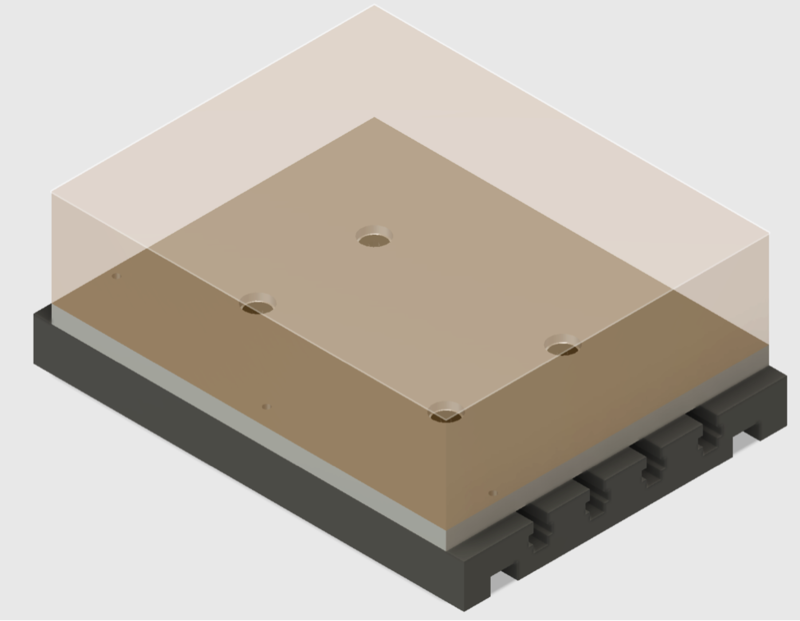 A rendering showing the milling machine’s machining boundaries with spoilboard installed. In the software, make sure that your material dimensions are correct and that any additional placement offsets you’ve added to the material or plan are as expected. Note: Fusion 360 has preconfigured retraction heights for some toolpaths that cause collisions in the milling machine. You can reduce these heights by editing the toolpath settings and changing the values for the clearance, retract, and feed heights. 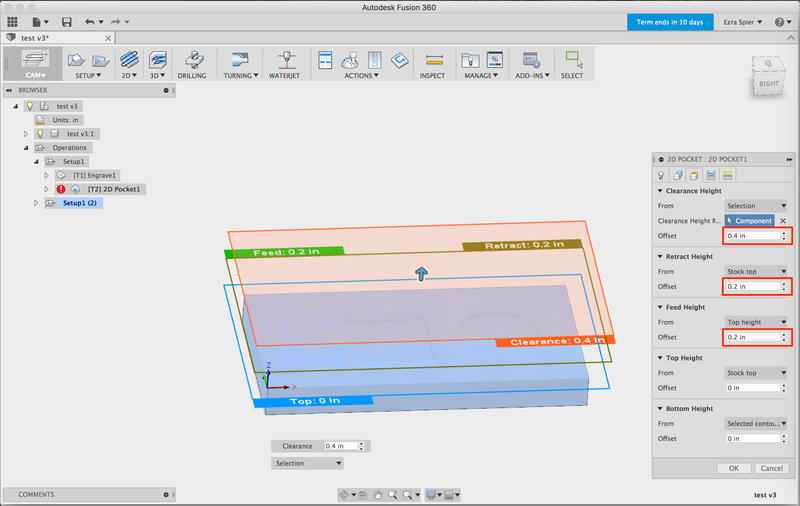 In Fusion 360, you may need to reduce the values in your toolpath’s Heights configuration. Are there times I would want to mill even if a warning appears? Yes. A collision warning will appear while facing your spoilboard. This is expected, as you’re intentionally milling outside of the expected milling boundaries. Are there any other things I should be aware of? The maximum retract height (distance between the spoil board and tool tip) will vary depending on how far the tool protrudes from the collet. This height will be slightly different every time a tool is installed. The tools we sell have an overall length of 1.5 in. If you are using tools with a greater overall length, you should take extra care to prevent collisions with the frame or workpiece. At the maximum retract height, longer tools may still protrude into the working volume and collide with the workpiece. After changing tools, it is possible to check the maximum retract height available with that tool. Press and hold the Z+ button in the Move panel to move the spindle as high as it will go. The Z value displayed in the top left corner of the the software window indicates the current distance from the spoilboard to the tip of the tool. This value is the total travel distance available in the Z axis. The maximum retract distance above the material is the displayed Z value minus the material height and any material or plan location offsets. What collisions doesn’t the software warn me about? Material collisions: Milling into material that should not be milled, or milling with a toolpath that is not intended to mill the material. If you experience a collision, or have any questions about collision warnings, please feel free to contact our support team at support@bantamtools.com.